This article is about the Dragon Quest character. For the real-life American historical figure seen in Mario's Time Machine, see George Washington Carver. 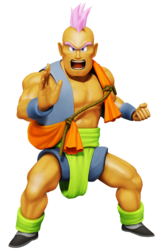 Carver is a character from Dragon Quest VI and a playable character in Itadaki Street DS and its sequel Fortune Street. In the Dragon Quest series, Carver is a strong fighter who has trouble remembering his past. He would later find out he is from Port Haven and the son of a talented couple of carpenters. Carver makes his introduction into the Mario franchise through the Mario and Dragon Quest cross-over game Itadaki Street DS. He is featured as one of eleven playable Dragon Quest series characters in this game. Being a Japanese exclusive game, Itadaki Street DS refers to the character as Hassan. Hassan Hair and Hassan's Clothings are collectible items that can be equipped on customizable characters. Carver reappears in the Wii sequel of Itadaki Street DS known as Fortune Street. He appears physically unchanged since his first appearance alongside Mario and friends. North American Official Site Bio: "Don't let this muscle-bound hulk's appearance deceive you. Carver is a gentle man. But can his carpentry skills build him a fortune on Fortune Street?" Spanish Ebanisto From "ebanistería" (Cabinetmaking), referring to his carpentry skills.